I’ve been grappling with my own questions of truth, authenticity, and self-awareness and was hoping for some insight, relatability, or even some good questions to take home and mull over. Perhaps my expectations were too great. Unfortunately, my companions Caryhn and Yossie came away from tonight exactly as I did: puzzled, underwhelmed, and a bit exhausted. Firstly, if you’re going to put on a three-hour event, breaking it up into four separate plays is a good idea, especially if they have a unifying theme, as tonight’s plays–Prodigal, Deface, Letters to Myself, and Storia Pinocchio–did. They all touched on tales of the self, specifically self-deceit, self-absorption, and self-indulgence. First up was Prodigal–mine and Caryhn’s favourite play of the night–a short story about the complications of family, self-deception, and the blind loyalty that comes with only hearing one side of a story. Luke Slade (the highlight of the night for me), Aidan Kokorudz, Joyce Chan, and John Spataro delivered believable performances, and Stacey Foh’s writing and direction made for a nuanced, authentic tale of familial drama. While I found two of the three following plays much too long (more on that later), Prodigal is one I wanted to see more of. The climax hit, and just when I thought the veil of self-deceit would be lifted, the lights went down and I was left wondering if Slade’s Pete “got it” or not. It’s a show that I’d love to see expanded upon and re-mounted in the future. Next up was Deface, a vaguely futuristic dystopian tale about a time and place where human faces are manufactured and sold, featuring a “faceless” vigilante-esque character whose mission was quite unclear. In fact, most things about this play–the overarching theme, the big “reveal”, the plot–remain unclear, even after lengthy discussion about it. The acting felt amateurish and lacking in authenticity, more like listening to actors read lines than feeling the emotions of characters. There were many missed cues and bad timing with the faceless character and their “four voices” that a bit more rehearsal could certainly help with. As to why this character carried four voices around with them? I have no idea. My companions and I were totally confused and felt that it dragged on way too long, thanks in part to a ridiculous number of unnecessary transitions. I felt that maybe Defaced was trying too hard to be too clever and just ended up being too cheesy. I’m sorry to say that it won our unanimous Worst Play of The Night vote. Third was Yossie’s favourite (“because it was short”) Letters to Myself. With some exceptions–Luke Slade and Jose Gonzalez specifically–I found the acting once again to be amateurish and lacking in depth, emotion, and resonance. I just did not believe these characters, which was made worse by the muddled plot and lack of a back story. It appears to be a story about a man whose self-absorption leaves him blind to things crashing down around him, but I’m not sure. It could be the writing, or just the lack of connection between the actors and their characters, but I failed to grasp the point or connect with the story at all. Points to Jose Gonzalez for some badly-needed comic relief. Speaking of comic relief, let’s talk about the last show of the evening, Storia Pinocchio. Harkening back to the old travelling comedy troupes of Italy, it–very loosely–tells the original story of Pinocchio. With lots of interaction, breaking of the fourth wall, and comedy, it was a welcome end to what was becoming a very long night. While I don’t think it would have worked anywhere else in the evening’s line-up, and while I was thankful for something fun and lively, it did seem a bit out of place after three much more serious plays. It also seemed to drag on for SO. LONG. This may be due to the length of the preceding plays, or the long-ish introductions between each act (all of which we could have easily been read in the program). Overall, my companions and I enjoyed Storia Pinocchio and found it quite funny. It’s also worth mentioning issues with the venue. Aki Studio, in my experience, is always WAY too warm, and my companions felt the heat too. In addition, the seats are so close together, and it’s a fairly small space, so it doesn’t take long to overheat and feel uncomfortable in the small chairs. At one point my companions almost had to leave, but luckily intermission came. It’s not a venue I’d recommend for anything over an hour and a half, and it definitely increased our fatigue while decreasing our patience with this evening’s performances. To be fair, most theatres have tiny chairs, but it’s nice when they space them apart a bit and set the temperature bearing in mind all of those bodies crammed in a small room together. It’s fair to say that this lessened our enjoyment of the evening, but only slightly. You take some good. You take some bad. You take some out-there themes, mix them up with some super familiar themes, add in a slightly misplaced dash of hilarity and then you have… Artifice. Run Time: 3 hours with one 15-minute intermission. 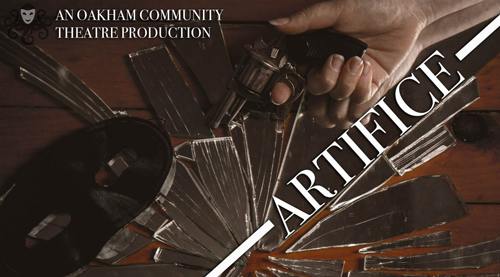 Audience Advisory: Domestic abuse, alcohol abuse, violence, language and mature themes.